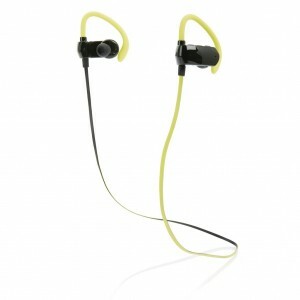 In-ear earphones with 3,5 mm audio Jack and epoxy domes. With custom made, polyester earphones lanyard, with sublimation printed graphics on both sides. Price includes epoxy dome and sublimation printing. MOQ: 100 pcs. 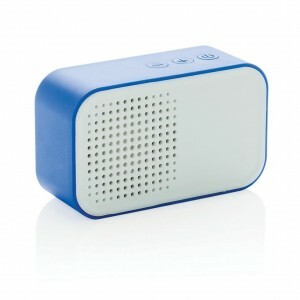 3W Waterproof IPX4 shower speaker that enables you to listen wirelessly to your favorite music while taking a shower. 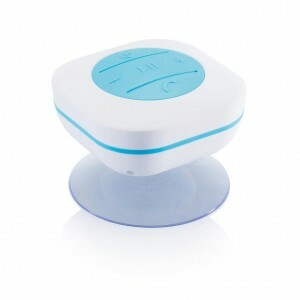 Comes with 500 mAh battery and suction cup to easily stick the item on any surface. 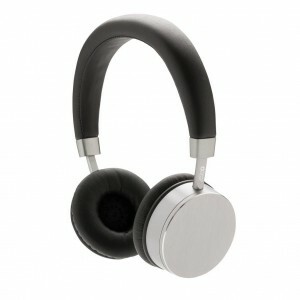 Comfortable wireless headphone made out of ABS with rubber finish, packed in EVA pouch. 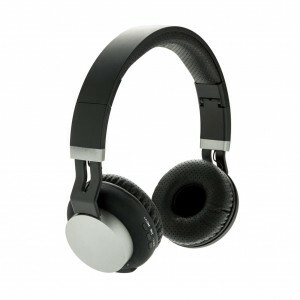 The ability to fold the headphone makes it easy to carry them in your backpack or suitcase. Can also be used with included audio jack cable. 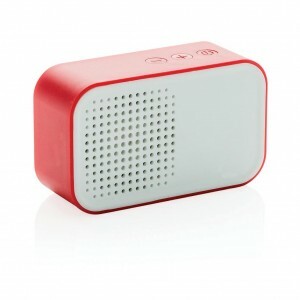 Wireless 3W speaker with cool retro design. With 400 mAh battery for up to 4 hours of playing time. Including play/pause and volume buttons. With wireless BT 4.1 and 10 metre operating distance. Can be fully charged within one hour. ABS casing silicon strips on the bottom to ensure stability and sound quality. Including micro USB cable for charging. 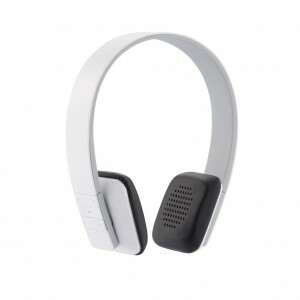 Listening to your music really becomes a pleasure with this wireless headphone. 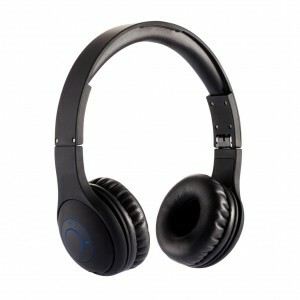 The soft cushions allow you to wear the headphone for a long time and the integrated control makes it easy to change your music or adjust the volume. 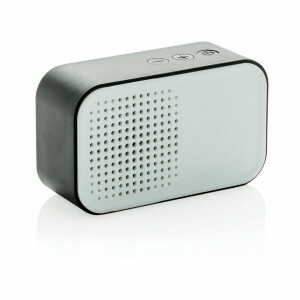 The integrated microphone gives you the possibility to use it for making calls. 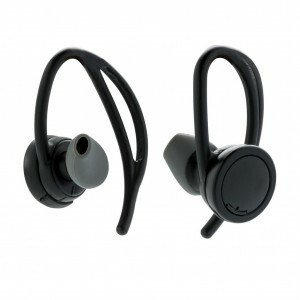 True wireless single earbud with state of the art wireless BT 4.1 module. Allows you to pick up calls and listen to music in a true wireless manner. Comes packed in a charging and carrying case with 480 mAh battery that can be used to recharge the earbud up to 8 times without any cables. Including extra ear tips to fit all and micro cable to charge the charging case. 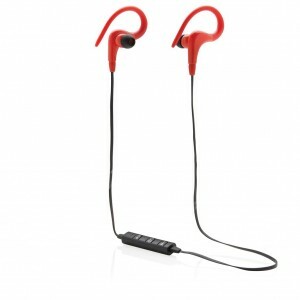 Wireless sport earphone that uses the latest wireless BT 4.1 technology to connect your mobile device. Operating distance up to 10 metres, play time up to 6 hours on a full charge and 180 hours in standby. Including 90mAh lithium battery that can be fully charged within 2 hours. The casing is made out of lightweight ABS. IPX 4 level waterproof. The music can be controlled with the buttons on top of the ear bud. Including EVA pouch. 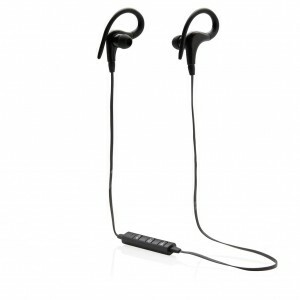 Wireless sport earbuds with high quality wireless BT 4.1 connection for easy connection and perfect sound quality. The ABS casing is sweat proof so optimized for sports. The ergonomic design guarantees perfect fit during your activities. The earbud has a volume up/down button, next/previous song button and a mic to answer calls. Operating distance up to 10 metres. Play time up to 4 hours on one charge and standby time of 120 hours. 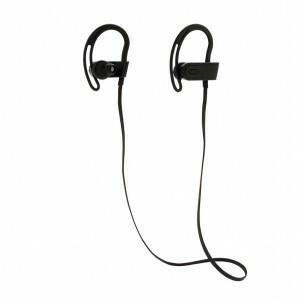 Wireless sport earbuds with 60 cm wire TPE cable. The earbuds are suitable for both sport and daily use because of their comfortable fit. Includes microphone to pick up and answer calls and volume buttons to control the volume. The device uses wireless BT 4.0 for smooth connection to your mobile device. The 55 mAh battery allows you to play up to 3 hours of your favourite music. Operating distance up to 10 metres. Including EVA zipper pouch. Including micro USB cable. Lightweight and comfortable true wireless earbuds perfect for outdoor activities and sports. The earbuds have an optimized fit to ensure a perfect sound experience. The earbuds come in a small charging case that is easy to take wherever you go. Pairing the earbuds is easy with the auto pair function. 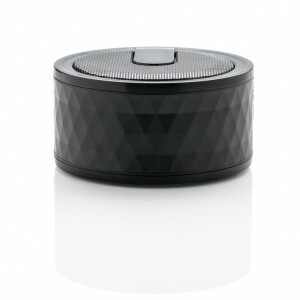 The fast BT 4.2 connection guarantees stable connection (up to 10 metres) and clear sound quality. 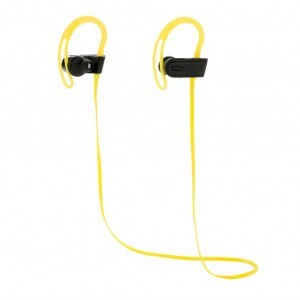 With 55 mAh battery that allows you to use the earbuds for up to two hours. Wireless headphones with comfortable on-ear pads and headband. The pads can rotated to make them fit every user perfectly. The headphones can be folded so it’s easy to take them with you wherever you go. The included string pouch makes it a perfect travel companion. With a 250 mAh battery to ensure a playing time up to 4 hours on one charge. BT 4.2 for smooth connection and operating distance up to 10 metres. Includes hands free function to answer calls. 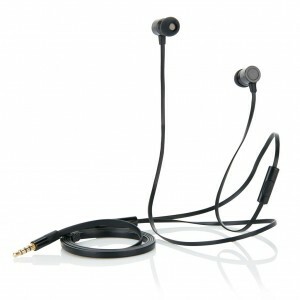 Fashionable flat wire ear buds with microphone and pick up function. The flat wire cable is 120 cm long and guides crystal clear sound to your ear buds. Including EVA pouch. 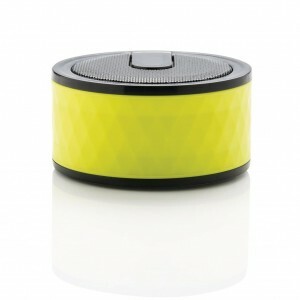 3W outdoor speaker with 400 mah battery. IP4 waterproof (splash proof) and colour changing lamp. 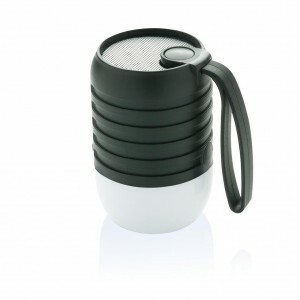 Perfect to take outside for a BBQ, party or even to the beach. With wireless BT 4.1 for smooth connection up to 10 metres and 4 hours of play time. Can be fully charged in 1 hour. Includes micro cable for charging. With a silicon strap to hang your speaker anywhere.